Apart from roadways, trains are the second largest network of public transportation in India. Earlier Indian Railway used to provide printed timetables to highlight the arrival and departure of respective trains. With technological development, Indian Railways also adopted modernization. Now the same time table can be attained from the official site of IRCTC. But not all are comfortable with the use of computers. Thus, Indian Railways has taken the service one step further. From now on, it will offer latest updates of train timings on WhatsApp. Most people have smartphones and so, it will be easy for them to get the details. How to get latest updates on train timings? 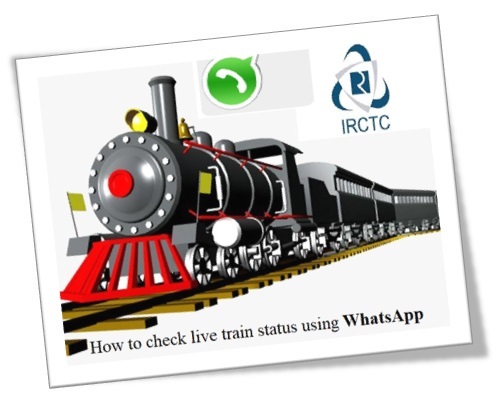 All travelers can save the IRCTC WhatsApp number in their contact list. That way, they will be able to see the WhatsApp account of IRCTC. When they need any information, they need to open the application and select the WhatsApp chat window for IRCTC. To attain details on any train, people have to type in the train number and send it via WhatsApp. This chat will trigger the server and IRCTC will send all latest updates about that particular train. The update will receive within seconds. It may be delayed if there are any issues with the server. Bio-toilets – Throwing human waste on railway tracks is neither hygienic nor environment friendly. To eradicate this issue, Indian Railway has decided to install bio-toilets in all trains. This task will be complete by 2019. IRCTC-ePay – As the name suggests, IRCTC-ePay is Indian Railways personalized payment gateway. It has not been launched yet. Once this online payment gateway is operational, people will not have to wait for long to receive refunds for cancellation of tickets. Redecorating – Central government and Railway department has taken the initiative to enhance the beauty of train coaches. Under this program, all train coaches will be repainted. It will change the existing blue color scheme to brown and beige. E-catering – With this service, the Indian Railway is offering commuters the opportunity to book their meals from an online portal. The payment has to be done online as well. Soon people will also be able to check their PNR status, live status of the train, the route the train will follow and other such details via RailGenie service. 8305699144 is the WhatsApp number for RailGenie. Saving this number in the contact list will make things easy for travelers. RailGenie remains active for 24 hours a day, 7 days a week.